The raised air intake or snorkel draws the air the engine needs just a bit higher than normal, where less sand and dust particles are. Especially in dusty or wet conditions like in deserts, this pre-cleans the air the engine “breathes“ and, thus, may be a factor in positively affecting the engine’s longevity. 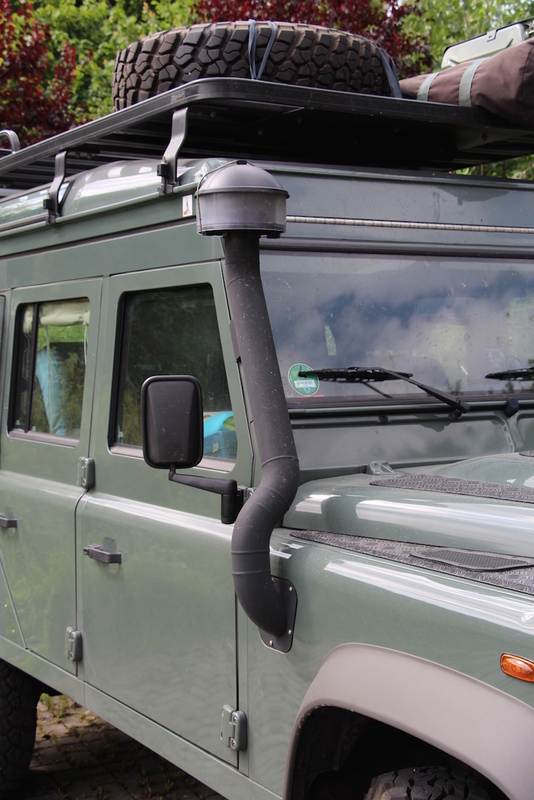 The raised air intake also gives one peace of mind in water crossings! 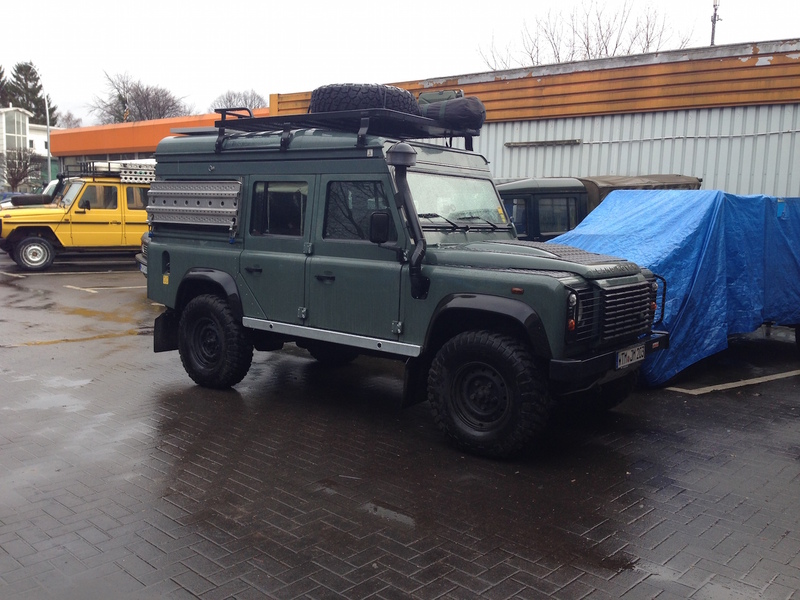 We chose the Ex-Tec one, simply because it is really solid and also fits the “old school“ look of the Land Rover. Undercarriage protection problably doesn’t seem to be of high importance to many tough offroaders, but we simply know that we do sometimes make mistakes when driving and the alloy bashplate in the front and the steering bar and differential protectors simply reduce possible damage on the Land Rover’s underside. We, however, have not included engine sump, gearbox and fuel tank protection. 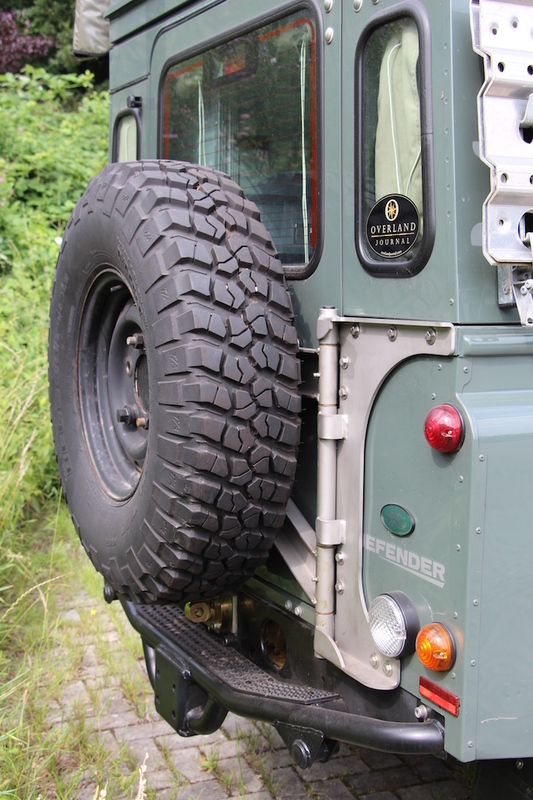 As the Land Rover doesn’t have a rear bumper as a standard, we have included that as well. For side impact protection and improved jacking points have had rocksliders installed. Headlight bars protect the headlights and checker-plate protects the bonnet. The suspension of Land Rover Defenders seems to be in need of improvement, especially when driving on-road and even more so after a conversion, which can increase the gross vehicle weight immensely. 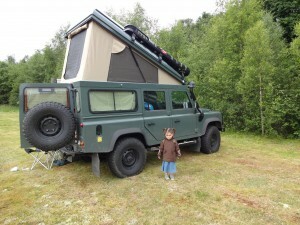 In our case, especially the poptop roof and the interior conversion considerably add to the weight. Because of that, we have uprated the suspension and exchanged the original coil springs front and rear with HD coil springs from the Australian manufacturer OME (Old Man Emu). We have also exchanged the Land Rover dampers with Koni Heavy Track Raid front and rear. At the rear side, due to the weight of the vehicle being more intensive there, we have opted for double dampers Koni Heavy Track Raid plus Koni Heavy Track. This reduces the “rolling“ both on and offroad. Our suspension upgrade goes along with a 2’’ lift, which increases the wheel travel. For the lift, we also had to install a double cardonic prop shaft. Instead of the “normal“, white Land Rover steel rims, we chose the (black) HD (“Wolf“) steel rims of the Land Rover Defender 130. The tyre discussion for overland 4x4s has no real final conclusion, so we chose what was recommended to us by Ex-Tec, Offroad Manufaktur, and our Land Rover dealer: BF Goodridge Mud-Terrain T/A KM2, which have the recommendation to last for at least 100,000 km and accept nearly every terrain. From experiences in Australia, we chose to carry not only one spare wheel, but two – this certainly adds considerable weight but gives additional peace of mind. Whether that is really necessary, we don’t know so far! We chose not to install extra lighting but decided to simply upgrade the vehicle’s headlights. 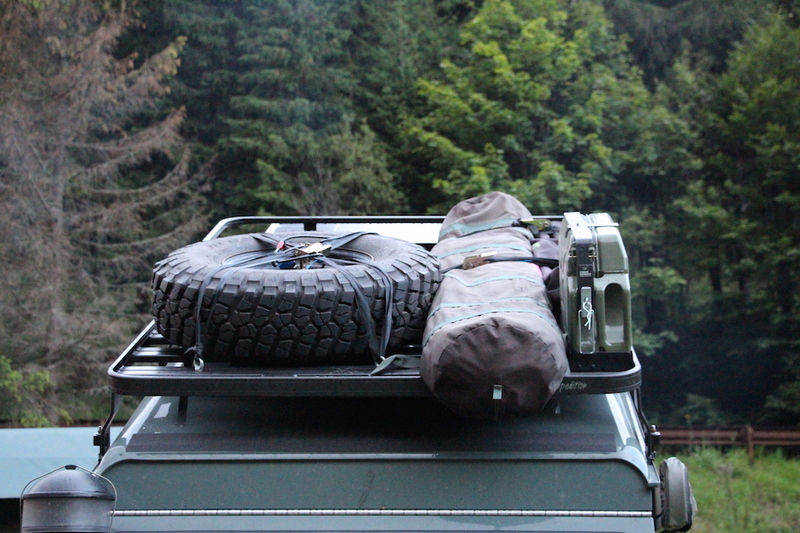 The standard spare wheel carrier on the back door may be OK for on-road use, but certainly not for any serious overland travel. The door hinges certainly will not be able to withstand the vibrations caused by severe corrugations, so we chose to have a proper HD spare wheel carrier installed at the back door. The Ex-Tec Spare Wheel Carrier seems to be a good solution, so that’s what we have now. The second spare wheel is fitted to the roof rack on the front passenger’s side. The 75 litre standard diesel tank is not sufficient enough, especially as the fuel efficiency after the conversion has slightly dropped. So, we installed an additional 45 litre long range tank in the back right corner of the Land Rover. This gives us a range of about 1000 km (on-road and “normal“ tracks). 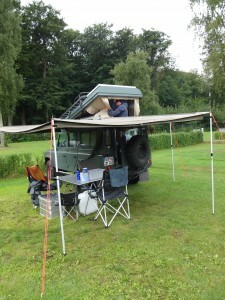 We also carry one 20 l jerry can on the roof rack, which gives us an additional 160 km range. 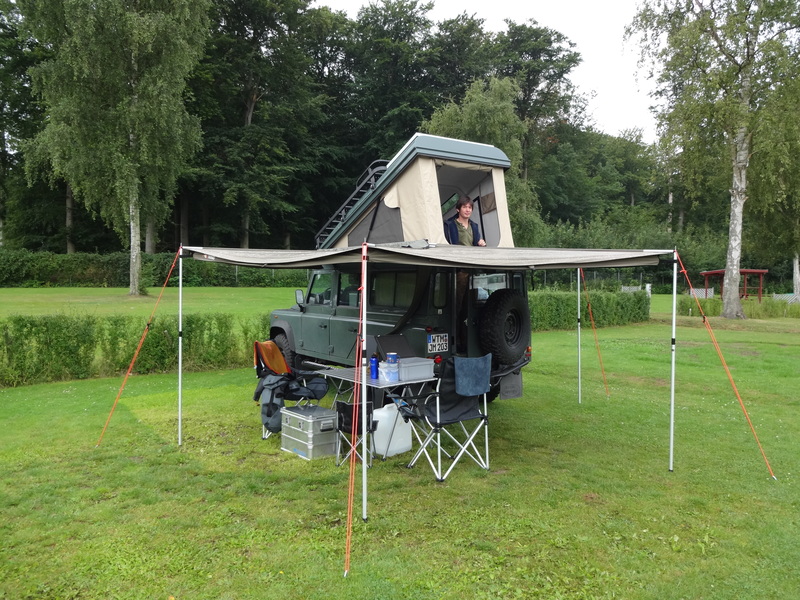 The roof rack originally is for the Land Rover Defender 90 and we chose it because it puts the weight on the middle part of the Land Rover (good for putting up the poptop) and also enabled us to fit a solar panel on the roof behind the roof rack. 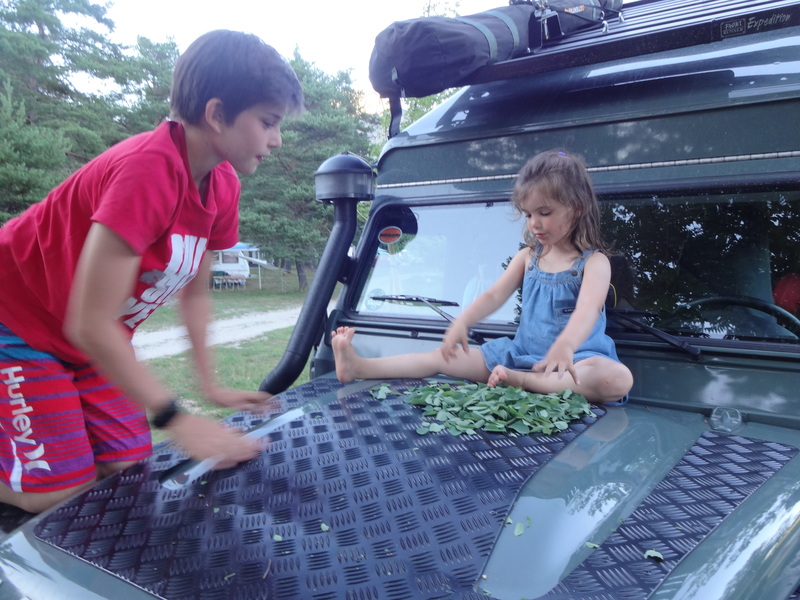 As we don’t want to overload the vehicle and especially not the roof rack, as this increases the danger of rolling the vehicle, we only put the second spare wheel, one 20 l jerry can and the Oz-Tent on the roof rack. For better traction in sand and mud, we have two sand ladders (PSP), which are also (when padlocked) used to protect the passenger’s side rear side window. Yes, roof tents exactly fit the Land Rover’s expedition image! They simply are great! Period! But we wanted all of us to be able to sleep inside the vehicle, so for a car the size of a Land Rover 110, the only solution was a wedge-shaped poptop, as we don’t really like fixed raised roofs as they simply destroy the “normal“ Land Rover look. In cold and windy climate, a poptop also can be the slightly better solution compared to a roof tent. Inside the poptop we have a wonderful “queen size“ bed with a customized latex/slatted-frame mattress by Fanello in Switzerland. After our experiences so far, we would recommend a poptop, but not the manufaturer we chose (due to many reasons). Really good poptops you get from “Ex-Tec“ in Bavaria, “Alu Cab“ in South Africa (in Germany the “Offroad Manufaktur Hamburg“ has them) and “Mulgo“ in Australia. There certainly are more good manufacturers on the market! 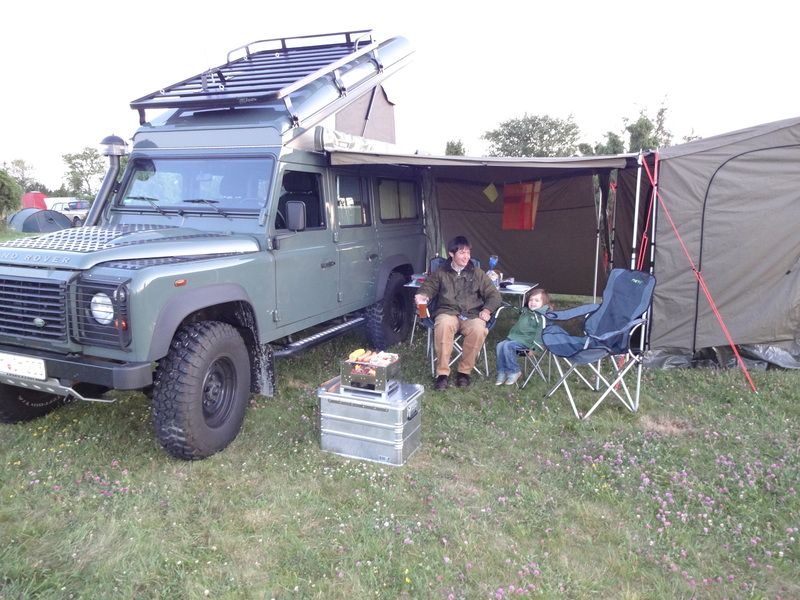 The foxwing awning simply is great ... within minutes, you can set up a large awning and you can even zip side panels and an Oz-Tent to it. Simply great! We also tested the foxwing in extremely windy conditions (a thunderstorm in southern France) and it definitely stood the test! Buy one!